Edinburgh interim head coach Duncan Hodge is delighted to welcome Scotland tighthead WP Nel back for today’s crunch European Challenge Cup clash against Harlequins in London. The prop has not featured since the home game with Quins, which Edinburgh memorably won 36-35. A neck problem which had lingered well beyond the initial four weeks off was prescribed at the end of October and ruled him out of Scotland’s autumn Test series. “It has never been definite when he would come back,” said Hodge. “When he got the all clear he had to rehab before he got back playing and you never know how long that will take. “He looks in great shape and he is happy. The next step is to play consistent rugby which is great for Edinburgh and good for everyone. “With a lot of these injuries it does not take much to swing you one way or another by a week or a couple. When you rehab another thing happens to another body part and that shifts things a week. The coach confirmed that, all being well, Nel was ready to return to the Test fold in the Six Nations, with national coach Vern Cotter naming his squad for this year’s tournament on Wednesday. “Yeah, in terms of the way he has played for Scotland over the past couple of years if he gets fit and proves himself over the next couple of weeks you would think he had a very good chance,” said Hodge. Watson also returns to the side for this afternoon’s match at Twickenham Stoop, with Phil Burleigh back at inside-centre and Tom Brown set to start on the left wing. Edinburgh know that they probably need to win today to retain any hopes of reaching the knockout stages and pushing for a place in what would be a home final. The Aviva Premiership side know that a bonus-point win will guarantee their progress from Pool 5, while third-placed Stade Francais will be expected to garner a maximum return at Timisoara Saracens and haul themselves back into the race for second place. 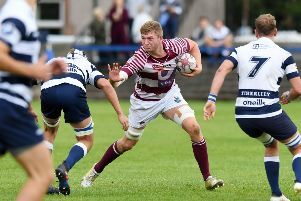 Edinburgh are determined to get the result which would set up a tantalising first match at their new Myreside home on Friday evening and Hodge added: “We are going down there to win the game and that would take any peripheral stuff out of the equation. “It is a big game against a big side away from home. Both sides are doing well in the competition, we did not have a game last week and we have a big couple of months coming up. “[In the last game] it was a nice dry day. We got some space. They had all their big names playing that day, big crowd, it was good to score some tries that day. “It will be a different game away from home. We are two months down the line. “There’s a lot at stake for both sides tomorrow, which makes for an exciting tie. The kick-off times for May’s finals weekend have now been confirmed. Europe’s showpiece matches at BT Murrayfield will get under way on Friday, May 12 with the Challenge Cup final which kicks-off at 8.00pm. The Champions Cup final goes ahead on Saturday, May 13 with a 5.00pm kick-off and the first Challenge Cup Qualifying Competition final will be staged on the same day, with the kick-off time to be confirmed shortly.